Location. 35° 8.842′ N, 90° 2.898′ W. Marker is in Memphis, Tennessee, in Shelby County. Marker is on Adams Avenue, on the right when traveling west. Touch for map. 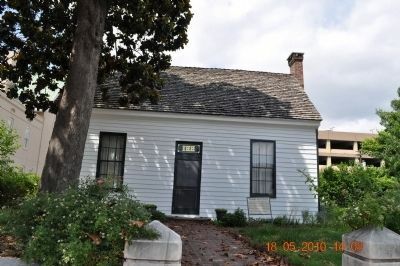 Marker is at or near this postal address: 198 Adams Avenue, Memphis TN 38103, United States of America. Touch for directions. 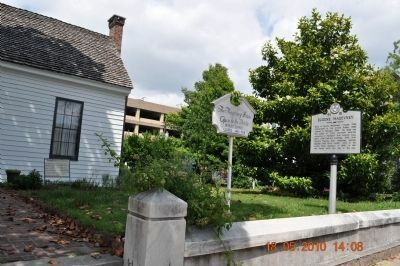 (within shouting distance of this marker); St. Peter Catholic Church (within shouting distance of this marker); Forrest and the Memphis Slave Trade (about 300 feet away, measured in a direct line); The First Lee House (about 400 feet away); Statuary at the Shelby County Courthouse (about 400 feet away); Shelby County Courthouse (about 500 feet away). Touch for a list and map of all markers in Memphis. More. 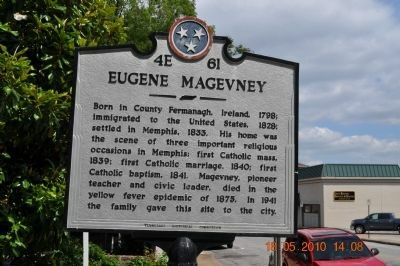 Search the internet for Eugene Magevney. Credits. This page was last revised on June 16, 2016. This page originally submitted on July 1, 2010, by Sandra Hughes of Killen, Usa. This page has been viewed 754 times since then and 6 times this year. Photos: 1, 2, 3. submitted on July 1, 2010, by Sandra Hughes of Killen, Usa. • Craig Swain was the editor who published this page.